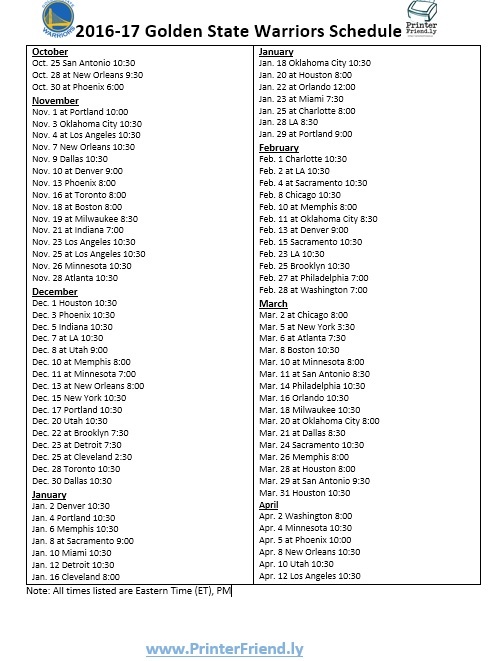 If you are looking for the current, free printable 2016-17 Golden State Warriors basketball schedule, you have found the right place. We off the schedule for fans to enjoy in both image and PDF format to share and repost freely. Fans are a-buzz about how much better the Golden State Warriors can be this season with the recent signing of free agent Keven Durant. Golden State will kick off the regular season on October 25th at home by hosting the San Antonio Spurs. The final game of the team’s season will be held on April 12th at home against Los Angeles. You can now get your free, printable Golden State Warriors basketball schedule from PrinterFriend.ly by downloading our PDF here. Alternatively, we have the schedule posted for you to use above while you follow the Warriors on their path to the NBA Playoffs this season! Enjoy!